Go Here For Hotels In This Area. In the 7th century this area was a hub of commercial activity due in great part to the Jewish community that thrived in the neighborhood. The first church was constructed in the 6th century by Childeric I of the Merovingian Dynasty. This building was destroyed by the Normans at the end of the 9th century, but was later rebuilt by Robert II in the early years of the 10th century. Many people lived in this neighborhood of Saint Germain l'Auxerrois and at the nearby port on the Seine river. By the 13th century, the growth of the parish required an expansion of the church. In the 14th century, when the king decided to live at the Louvre, this parish became the Royal Church and remained so for several centuries. 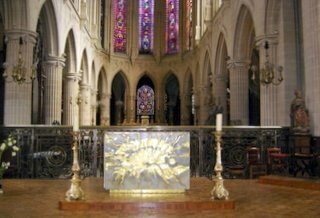 During the 17th century, peace having returned to the city, the parish of Saint Germain l'Auxerrois saw a new influx of parishioners and the church underwent another period of expansion. At the height of the French Revolution, the church was used as a storage facility for animal feed and for gunpowder. 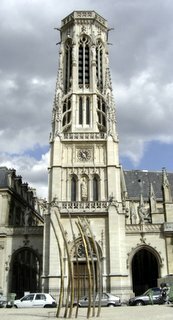 Following the Reign of Terror, Saint Germain l'Auxerrois was one of twelve in Paris that was allowed to return to its mission as a church. During the 19th century, an intense campaign of public relations and renovation kept the church from being destroyed. 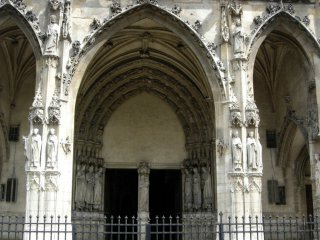 Although the church of Saint Germain l'Auxerrois is predominately gothic in style, it is composed of an assortment of styles, closely related to its history. There is little left of the Merovingian past except for the cemetery which was rediscovered in the 19th century. Of the important work done in the 12th century little remains but part of the romanesque tower, south of the main choir. From the 13th century enlargements, there remains the Chapel of the Virgin and the west entrance of the choir. 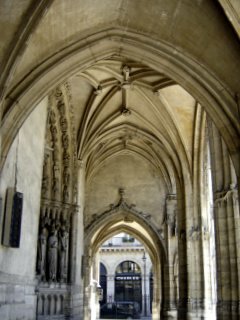 During the early decades of the 15th century the church, already used as the "royal parish", underwent some great changes, most notably the construction of the nave, the gothic porch and the north chapel. A rood screen was installed in Saint Germain l'Auxerrois in the 16th century but was taken down in 1754 at the request of the clergy who would be engaged in the singing of the Liturgy of the Hours. It maintained the privacy of the monks and also served to partition the church to help keep it warmer in the choir where the monks or canons would gather in the early morning hours. It was also used for the reading of the Lessons during the liturgy. 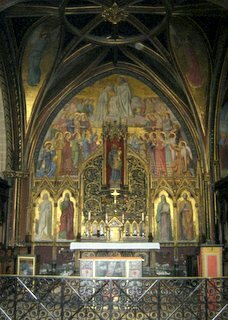 The only example of a rood screen still in existence in Paris is in the Church of Saint Etienne du Mont. It is an exquisite piece of architecture and well worth the visit. 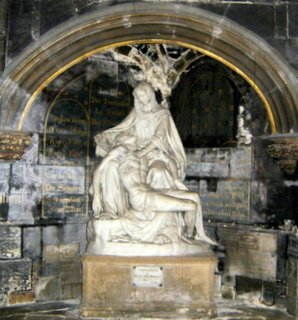 Two bas relief sculptures by Pierre Lescot were once in the church of Saint Germain l'Auxerrois but have since been moved to the Louvre. They are the "The Burial of Christ" and "The Four Evangelists". In the Chapel of the Virgin can be seen mural paintings by Amaury-Duval who was a student of Ingres. There is a painting of Saint Landry by Joseph Guichard dating from 1843. 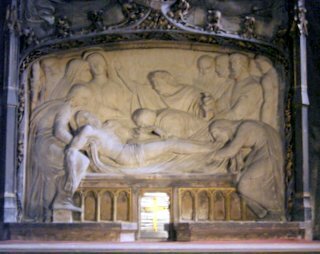 Saint Landry was a bishop of Paris in 650 and tradition has it that he built the first hospital, the Hôtel Dieu. The story also goes that during the reign of Clovis II Saint Landry sold the vessels of the church to feed the people during a famine. There are quite a few exquisite marbles inside the church dating from the 17th century. The facade of Saint Germain l'Auxerrois also has some fine pieces from the 19th century restoration of the building. 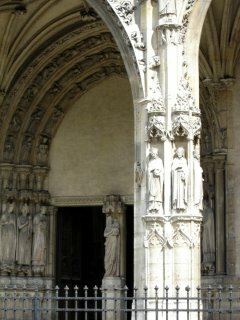 St. Germain was a confessor and later Bishop of Auxerre. He was born in Auxerre, France, around 380, and died in Ravenna, Italy, in 448. After marrying and practising law in Rome, Germain returned to Gaul as a provincial governor, where he was given the clerical tonsure by Saint Amator, Bishop of Auxerre. He soon accepted Amator's act as providential. He embraced the clerical state and succeeded Amator in 418. Around 431, he was sent on a mission to Britain to oppose Pelagianism. Seven years later, he died in Italy while personally appealing to the emperor for clemency towards the rebellious Armoricans. His relics, which were at Auxerre, were dispersed by the Huguenots in 1567. A finger was brought to Selby Abbey, England, in 1150. 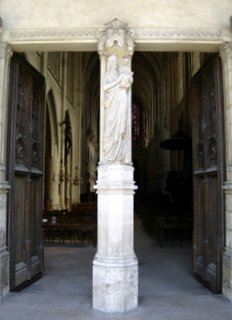 Saint Germain is the Patron of Auxerre, France. The Feast Day of St. Germain is July 31.